What Day Of The Week Is May 13? 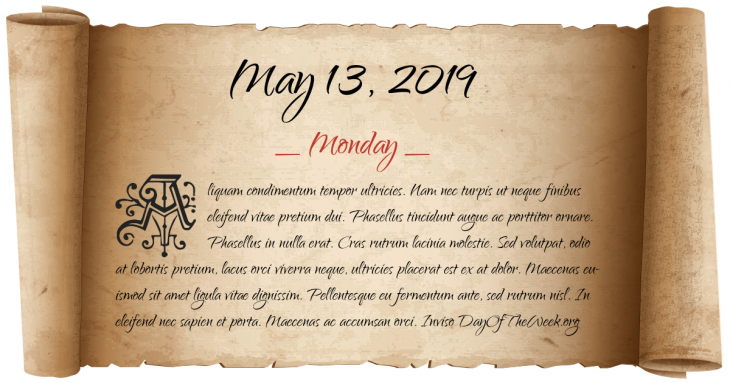 May 13, 2019 is the 133rd day of the year 2019 in the Gregorian calendar. There are 232 days remaining until the end of the year. The day of the week is Monday. 1948 Arab-Israeli War: the Kfar Etzion massacre is committed by Arab irregulars, the day before the declaration of independence of the state of Israel on May 14. The first round of the Formula One World Championship is held at Silverstone. Johnny Carson makes his last television appearance on Late Show with David Letterman. A 33 years old British mother Alison Hargreaves, became the first woman to conquer Everest without oxygen or the help of sherpas. The Binh Bridge opens to traffic in Hai Phong, Vietnam. the 2011 Charsadda bombing in the Charsadda District of Pakistan two bombs exploded killing 98 and wounding 140.
Who were born on May 13?